Looking to build a new deck, replace or add on to your existing deck? Unless your deck is less than two feet above finished grade (measured from the top of the finished deck to finished grade at any point around the deck), you require a permit prior to starting the work. Any enclosure or roof (not including an open air pergola) over a deck or patio also requires permits. 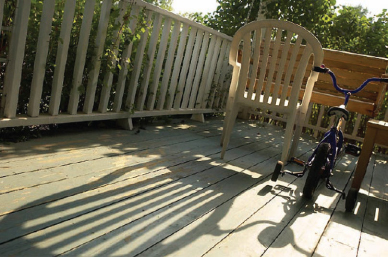 The building a deck brochure outlines the requirements for obtaining a permit, as well as the safety requirements you must follow in the construction of your deck. For a copy of the most recent brochure, please contact Building Inspections. When your deck is complete, an inspection is required. Please note that access below the deck is required at the time of inspection. To apply for a deck permit, complete the accessory permit application form and submit it to Building Inspections. A list of permit application requirements is provided in the accessory permit application checklist. The cost of the required permits is set out in the permit fees bylaw.